The employees of Nakkheeran have been named as accused in the FIR registered over which the editor R Gopal was arrested by police and subsequently released by a city court. CHENNAI: Thirty-five employees, including journalists, of a Tamil weekly have moved the Madras High Court seeking anticipatory bail in connection with a case filed against them and the magazine's editor over articles that allegedly disparaged Governor Banwarilal Purohit. The employees of the vernacular 'Nakkheeran' have been named as accused in the FIR registered over which the editor R Gopal was arrested by police and subsequently released by a city court. On October 9, Gopal was picked up by a police team from the airport here, when he was on his way to Pune. The weekly's website claimed that Gopal was arrested following a complaint from Raj Bhavan over publication of a series of articles in Nakkheeran related to an assistant professor of a private college who allegedly asked girl students to extend sexual favours to university officials in return for marks and money. Assistant professor Nirmala Devi, who taught at the college in Aruppukottai affiliated to the Madurai Kamaraj University, was later arrested. The scandal came to light in April this year after an audio tape of a purported conversation between Nirmala Devi and some students surfaced. Governor Purohit had rejected the professor's claim which she purportedly made in the audio tape about knowing him and having access to him. Purohit insisted he did not know her. 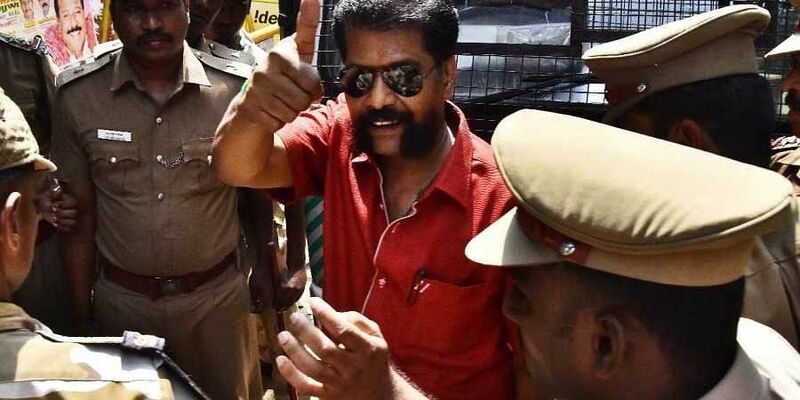 Based on a complaint filed by Governor's secretary, the police had registered a case against Gopal under IPC Section 124 (assault against President or Governor). However, when Gopal was produced before a magistrate court for remand, the court had rejected the plea of police to remand him to judicial custody. The court had enlarged Gopal on bail on a personal bond. Gopal's counsel, Shivakumar had told PTI that they planned to move the high court, seeking quashing of the case. Our respected Prime Minister is attending a function connected with the NHRC whilst in the Raajbhavanof Tamilnadu the staff of the His Excellence& Honourable Governor of Tamilnadu is preparing an appeal to get Mr "Gopal arrested !!! exceeding the arrogance of the former PM MS Indra Gandhi ??? The Honourable Governor was giving a mega Feast to Mr H Raja of the BJP for having criticised the Police ???? and the Judiciary. The entire Tamilnadu has been watching the the activities of the Honourable Governor of Tamilnadu Only God alone save Tamilnadu its people!!!!! !